You might wonder why they hate the yellow hair. 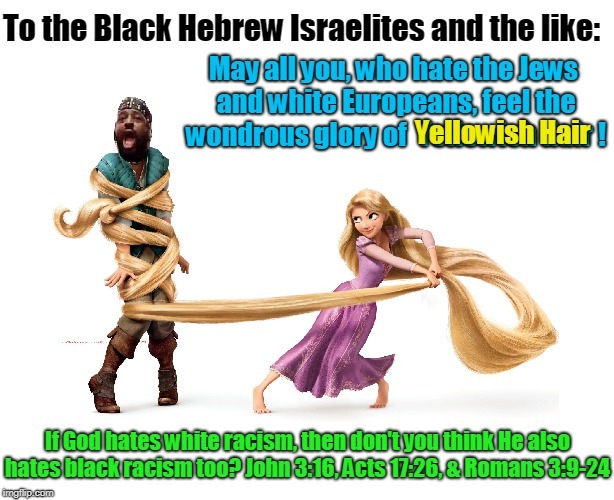 According to Black Hebrew theology (and the like): yellow hair is a hair color of an evil people as they've taken Leviticus 13:30 and spiritualized it to legitimize their hatred of the European ethnicity. They also hate the Jews as to them, the real Hebrews are black. Thus, they see the Jew are a fraudulent people. Not only that, they alleged that the Jews were behind black slavery so they hate the Jews as they do with Europeans. Interestingly they also hate Asians as well but they do not have the same hatred for the Native Americans and "Hispanics". To the Black Hebrew Israelites, the American Indians and Latinos are the 10 Lost Tribes of Israel. And unfortunately they're not alone as they're but one of the many Black Nationalist movements; both religious and secular. Not only that they're growing as tensions between the black community and law enforcement worsen but also becoming more militant as well. A number of Law Enforcement Officers have already been murdered by individuals with links to such groups and the violence will likely continue. "Return of the Violent Black Nationalist." Southern Poverty Law Center. Accessed April 28, 2018. https://www.splcenter.org/fighting-hate/intelligence-report/2017/return-violent-black-nationalist. I didn't tag this meme in any other but the most relevant of word description. So I've failed to see how you could be disturbed by the above meme, unless, you are a BHI or the like.